The expenses — which go before the city's spending board for approval Wednesday — include overtime for police and firefighters, damage to city-owned property and repaying other jurisdictions for police and other assistance. Henry J. Raymond, Baltimore's finance director, said the city can temporarily cover the costs from its rainy day fund while seeking reimbursement for up to 75 percent from Federal Emergency Management Agency. "The city remains on strong financial footing," Raymond said. "Hopefully, with the FEMA reimbursement, it will reduce the financial stress that we're under. In terms of the city's overall revenue structure, we're on firm footing and we'll move forward." Hogan has asked President Barack Obama to issue a disaster declaration so the city and state can be reimbursed for some expenses, officials said. Rawlings-Blake, meanwhile, encouraged city-based businesses to apply for aid from the U.S. Small Business Administration and the Baltimore Development Corp. The $20 million estimate released by city officials does not include the cost to businesses of the unrest. The figure also does not include state or federal costs. It's unclear when those figures will be tallied. Raymond said the $20 million in direct costs is based on figures submitted by various city agencies. He did not provide a breakdown, but said the figure also includes the cost to purchase equipment, such as riot gear and tear gas canisters, and pay for public works crews to clean city streets. He said the cost of the civil disturbance is expected to be larger when accounting for future lost taxes and economic impact. A preliminary economic impact estimate included in Hogan's request for the disaster declaration put the cost at $30.5 million. That included the loss of conventions, hospitality and leisure spending, and tourism from Orioles games that were closed to the public or moved to Tampa Bay, Fla.
Additionally, the Sun reported that almost 400 businesses were damaged as a result of the rioting. 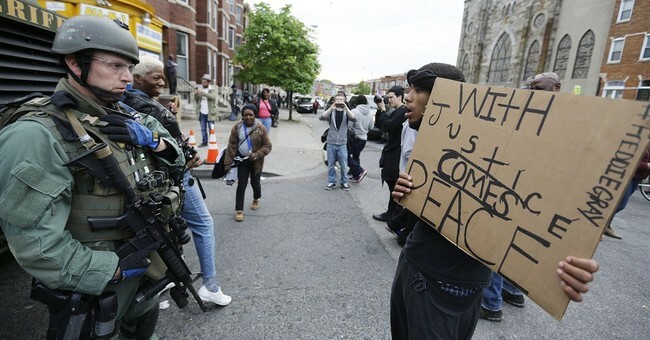 Additionally, the intense media scrutiny has led to Baltimore police becoming more “hesitant” in the wake of the indictments against the six officers who arrested Mr. Gray. The city has descended into violence, witnessing its most violent period in 40 years. In May, there were 43 homicides, surpassing the 42 homicides the city endured in August of 1990. There are no doubts that the police department had its issues, but the police aren’t the catalyst for the rise in homicides. While some on the left tried to defend the riots as an inevitable byproduct of institutional oppression, this hyper-emotionalism often exhibited by progressives with these issues–conservatives can fall victim to this as well–left them blind to the fact that these rioters were destroying their own neighborhoods. In turn, as Bloomberg’s Megan McArdle noted, rioting leaves these locals without shops to buy essential goods, leaves the area wide open for criminality to take hold, along with unemployment. Moreover, McArdle noted that the folks calling for disorder to address the issue only hurt themselves, “disorder will only fuel calls for order.” Hence, why the riots of the 1960s sort of lost political steam once the nation entered the 1970s. The televised theatrics of protesters engaging in urban ruin only strengthened law and order conservatives to the point where the vast majority of public opinion views such behavior not as inanely destructive. Baltimore will have to rebuild more than just storefronts. This could take generations–and the “blue model” is something that needs to be reconsidered. It’s failed the city spectacularly.